Each season has it’s own unique traits that make exploring nature special. In winter, everything is dormant and snow covers the ground. Summer is green, vibrant, and full of life. In fall, all of nature is preparing for it’s long winter sleep. And, in spring everything is waking up again. 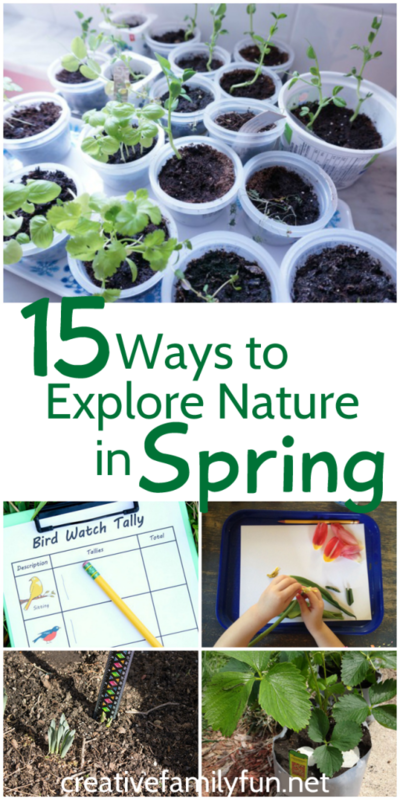 Take some time soon to explore nature in spring with your kids. Watch the earth wake up and see the plants poke through the ground. The animals are getting busy and suddenly the quietness of winter is replaced by the chirps, tweets, and chattering of the birds returning. 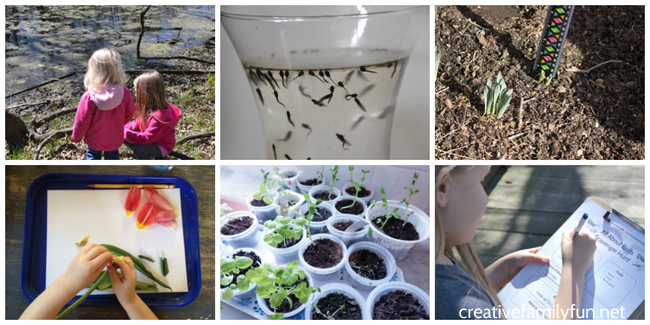 These 15 nature activities will help you explore gardens, birds, animals, seeds, and flowers. Pick out a few to do. It’s a great way to spend time with your kids while you explore nature in spring. 1. Examine your soil. Look closely at what your soil is made up of and test the pH level of your soil with these two experiments from The Educators’ Spin on It. 2. Don’t have a garden? Plant a few plants in a recycled milk jug. It’s eco-friendly and a great way to experience gardening in a small space. Inspiration Laboratories shows you how. 3. Plant a garden inspired by a favorite storybook. Kitchen Table Chronicles will help you plant Peter Rabbit’s Vegetable Patch or Growing Vegetable Soup Garden. 4. Have the birds come back to your neighborhood? 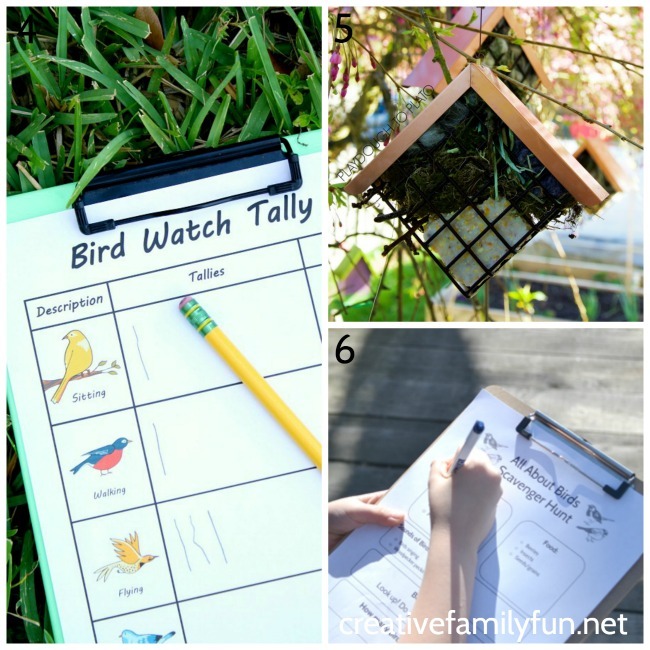 See how many you can find with this simple Bird Watch Tally from Fantastic Fun & Learning. 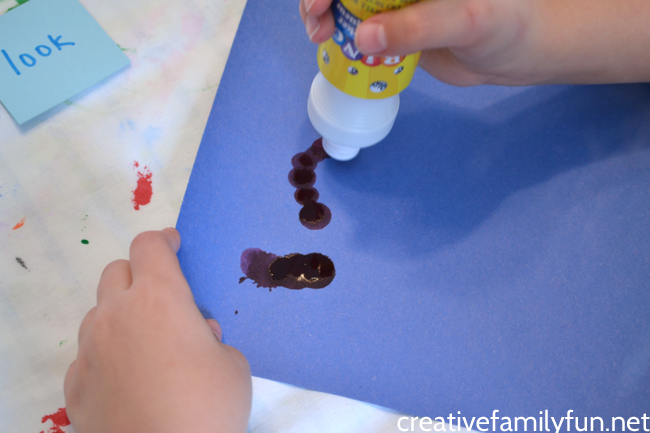 This activity is perfect for preschoolers! 5. It’s spring and the bird’s will be busy building nests. Help them out by making a Bird’s Nest Helper. You can find the instructions at Playdough to Plato. 6. Send your elementary-aged kids on a scavenger hunt to find signs of birds. Look for their food, nesting materials, sounds, and more with this All About Birds scavenger hunt at Inspiration Laboratories. 7. Find out what animals visit your yard at night. You might be surprised! Creekside Learning shows you how to set up a backyard animal tracking station. 8. Visit a local nature center, park, or lake to look for animal. 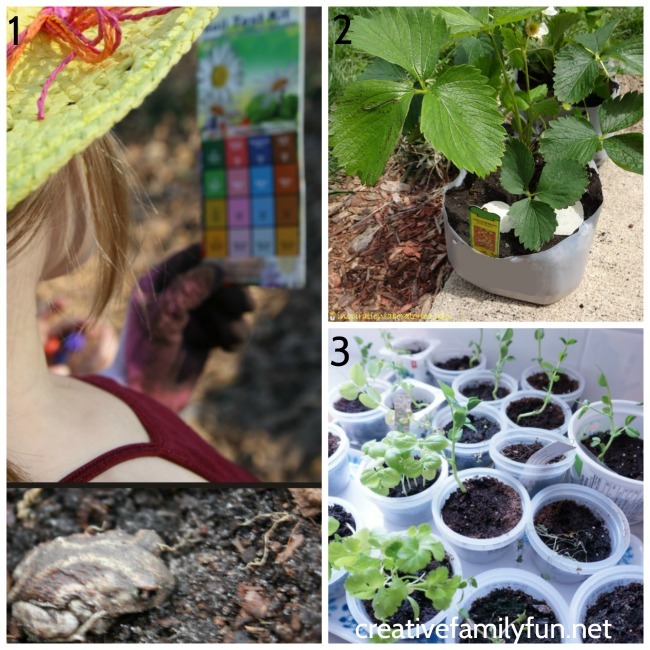 I’ve got some tips to help your kids observe nature safely and successfully. 9. Have you ever raised tadpoles? I haven’t, but it looks fascinating! Rainy Day Mum has all the info you need to raise your own tadpoles. 10. Get a close look at seeds with this seed sorting activity at No Time For Flashcards. 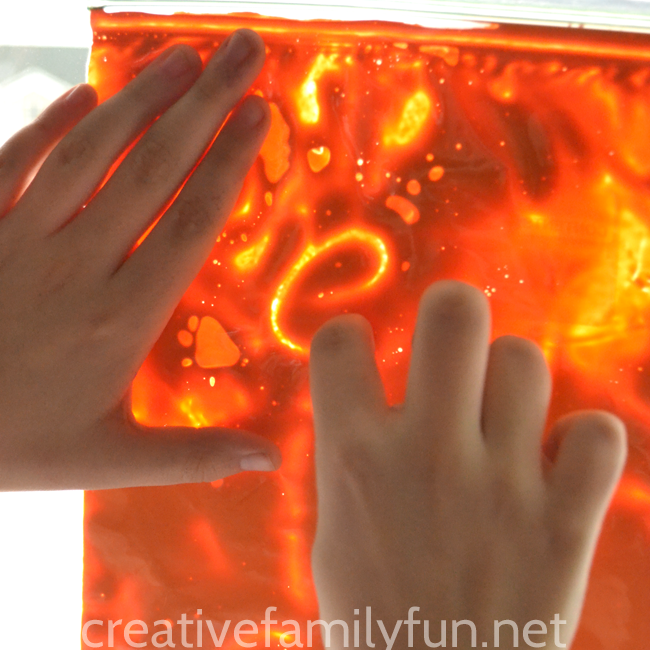 Depending on the age of your child, you can make this as easy or as hard as you would like. It all depends on the type of seeds that you buy. 11. A fast-growing seed is a fun way to really examine the growing process. You can make it fun by creating these Eggheads with Cress Hair from NurtureStore. 12. Look for seed in nature. How many can you find? 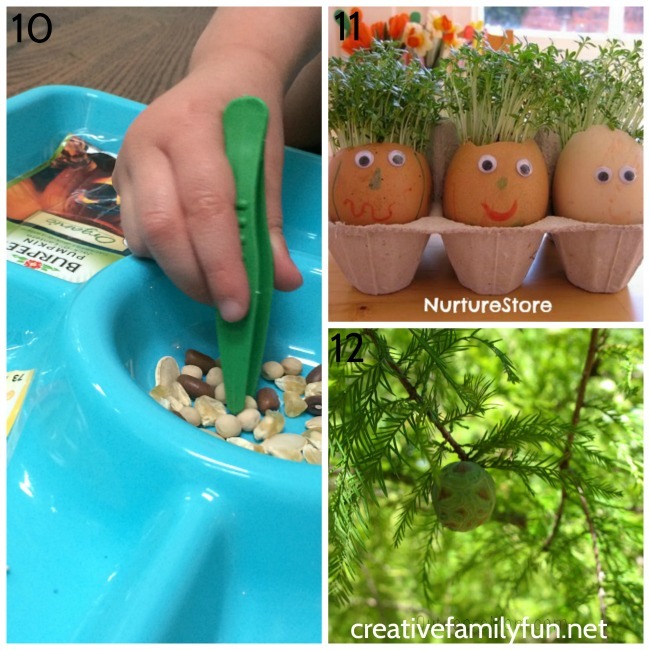 Go on a seed and nut hunt with OutdoorsMom. She’ll lead you on the way with tips for observation, questions to ask, and a craft project to do when you’re done. 13. Have flowers started sprouting in your neighborhood? 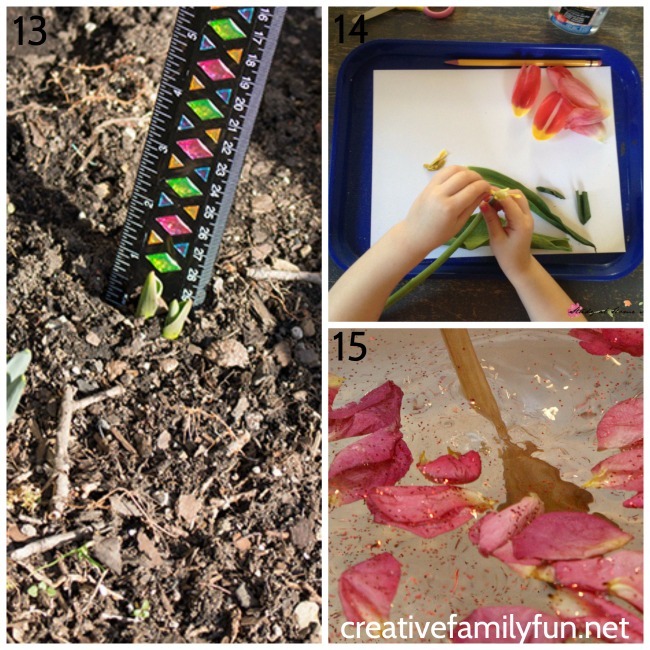 It’s time to get out and investigate with this Spring Flower STEM Investigation from Life Over C’s. 14. Take apart a flower. Examine all the parts of a flower and how they fit together with this Flower Dissection activity from Sugar, Spice, and Glitter. 15. Have fun and play while examining flowers. This Flower Petal Sensory tub from Fantastic Fun and Learning is a great way to experience flowers with your sense of smell, touch, and sight. It’s time to get out and investigate. 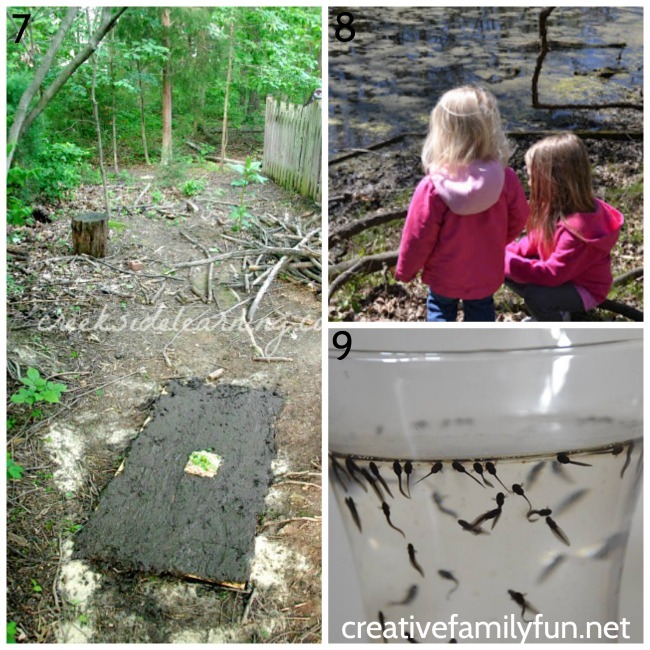 How are you and your kids going to explore nature in spring? Have you ever used dot markers? We used them most often when my girls were preschoolers. In fact, you can find tons of great ways to use them for toddlers and preschoolers. But, you don’t have to pack these away once your kids reach kindergarten. In fact, we got our out recently to practice our spelling words when we made Dot Marker Spelling Words. You’ll need some dot markers, blank paper, and your spelling list. Set-up takes no time at all! 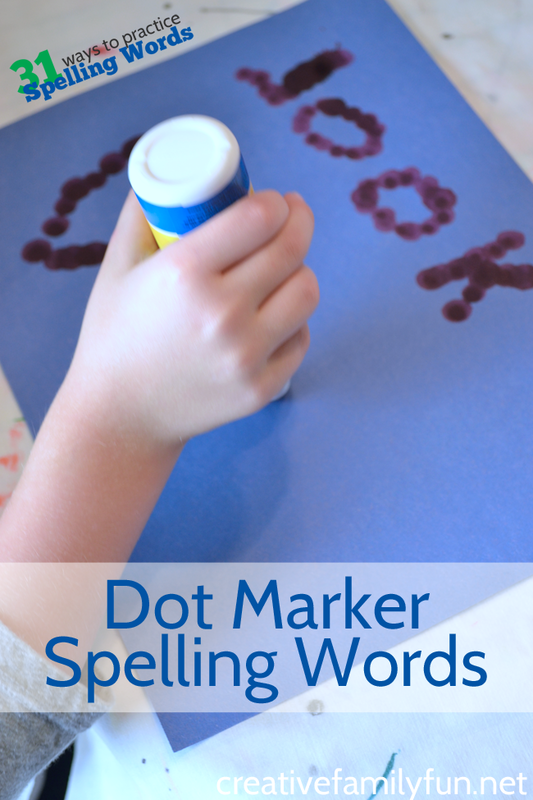 Have your child use the dot markers to create words using dots. Quite often, these words turn out big so you may go through several sheets of paper. You can conserve paper by using the back of scrap paper. Tip: BINGO markers work just as well as dot markers for this project. We found ours at the dollar store. It’s a fun challenge to make your words with dots and anything that makes spelling words fun is a winner in my book! 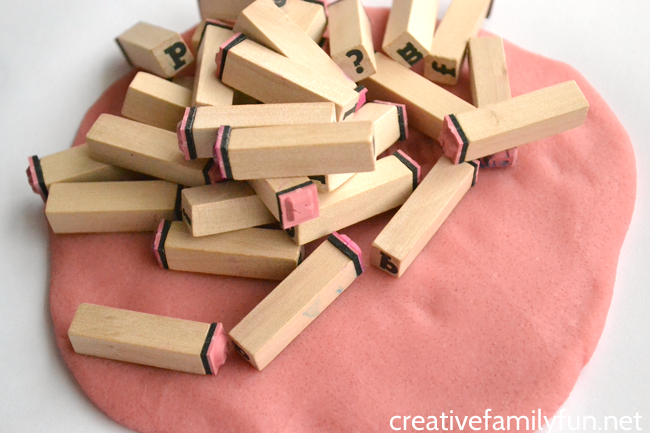 Do you remember early on in our 31 Ways to Practice Spelling Words series when we got out the play dough to make our words? 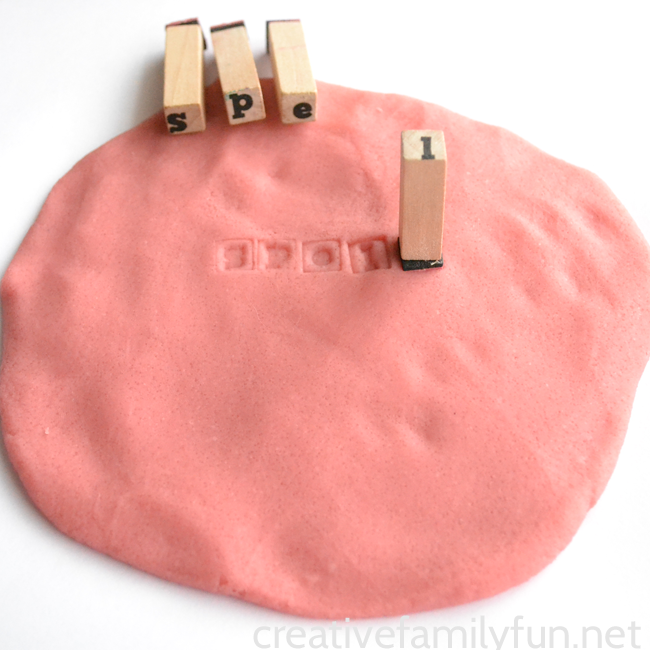 Well, today I’ve got another fun way to use play dough for your spelling words. We’re going to combine it with our letter stamps and have a little fun while we Practice Spelling with Letter Stamps and Play Dough. You’ll need some play dough and a set of letter stamps. Mold the play dough to make a flat surface. We’ll be using the play dough as our writing surface. 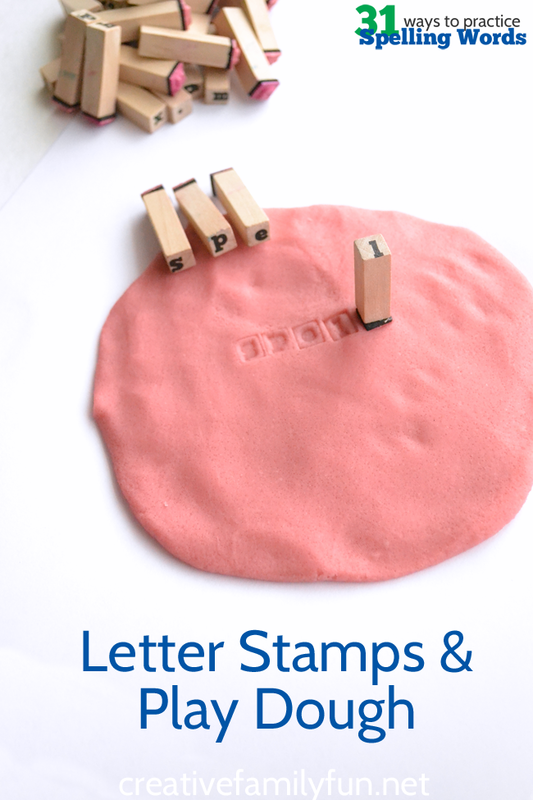 Have your child use the letter stamps to stamp their spelling words on the paper. Press lightly! If you press too hard, you can’t see the letters all that well. Tip: I love to make my own play dough, but store-bought works just as well. If you do want to make your own play dough my favorite recipe is Mama Miss’s Kool-Aid Dyed Play Dough. I made this batch with Tropical Punch and a little extra red food coloring. After your child has finished stamping all their spelling words, they’ll probably want to play with the play dough. I’m a firm believer that you’re never too old for play dough. It’s not just for toddlers and preschoolers! So, encourage them to play and get creative. Don’t forget to check the craft closet the next time your child needs to practice spelling words so they can practice spelling with letter stamps and play dough. I don’t remember where I first saw the concept of paint in a bag. It’s brilliant, isn’t it? I’ve seen it offered to kids from toddler age through preschool. 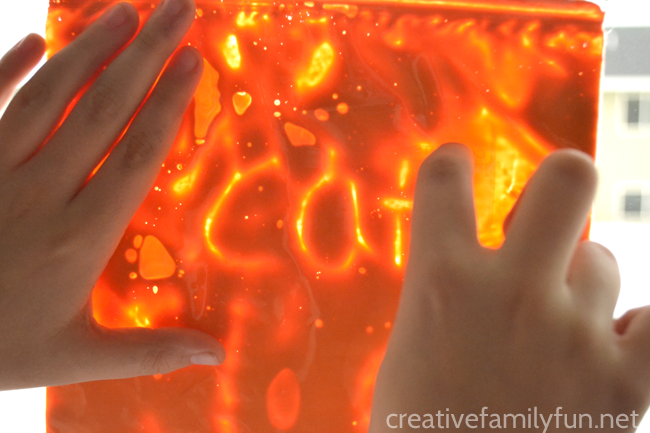 It’s often a fun sensory experience and a no-mess way for kids to play with paint. Having older kids, I’ve discovered that the fun shouldn’t end in preschool. We used our Paint in a Bag to practice our spelling words. You’ll need a plastic food storage bag, paint, and some packing tape (or duct tape). I chose a freezer bag because the plastic is thicker and sturdier. Pour paint in the bag while it’s laying flat. Squish it around a bit until you’ve filled the bag with a good layer of paint. Carefully close the bag, trying to remove as much air as you can. Use the tape to seal the zipper top so that the bag won’t easily open. Once your bag is ready, let your child use it to write their spelling words with their finger. You can “erase” the word by flattening the bag with the palm of your hand. It’s fun to use this to write the words over and over. Tip: My daughter loves to hold the bag up to the window on a sunny day. The light shining through gives it a fun glow. I haven’t tested it out fully, but your paint in a bag will last for quite awhile, especially if you were able to get all the air out. Store your paint in a bag flat in a safe place and you can use it over and over again. If the paint starts drying out, just toss it and make a new one. 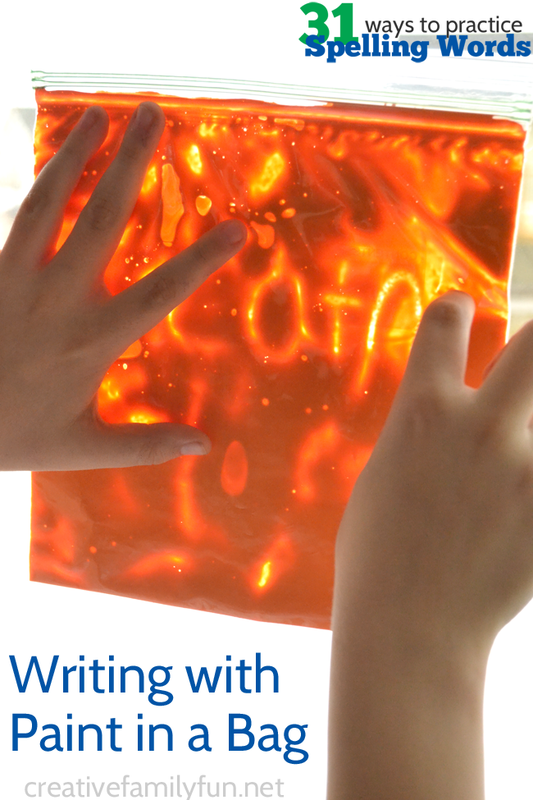 Your kids will jump at the chance to practice their spelling words if they get to write with paint in a bag. One of my favorite art techniques to play around with is watercolor resist. It’s fun and fascinating. And, when I love something, I try to find ways to incorporate in all areas. We’ve made plenty of art, we’ve also used this technique to write poetry, and now we’re using it to practice our spelling words with this Watercolor Resist Spelling Words project. Disclosure: This post contains Amazon Affiliate and other affiliate links. Please see my Disclosure Page for details. You’ll need white oil pastels (or white crayon), watercolor paints, white paper, and a cup of water. 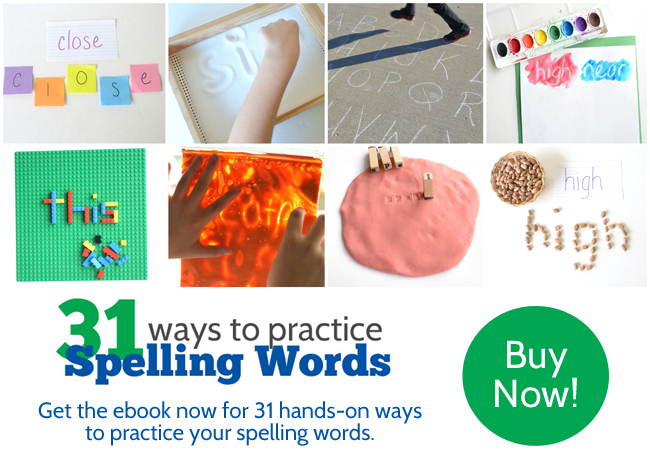 Set everything up as an invitation along with your list of spelling words. 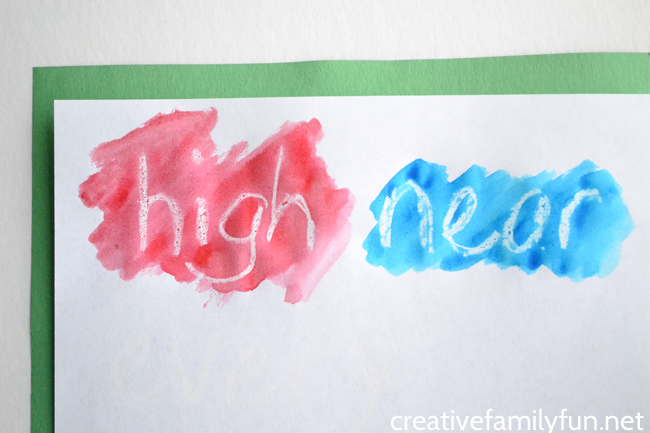 Have your child write their spelling words on the paper with the white oil pastel. It will be hard to see at first, but the fun will happen when they start painting. 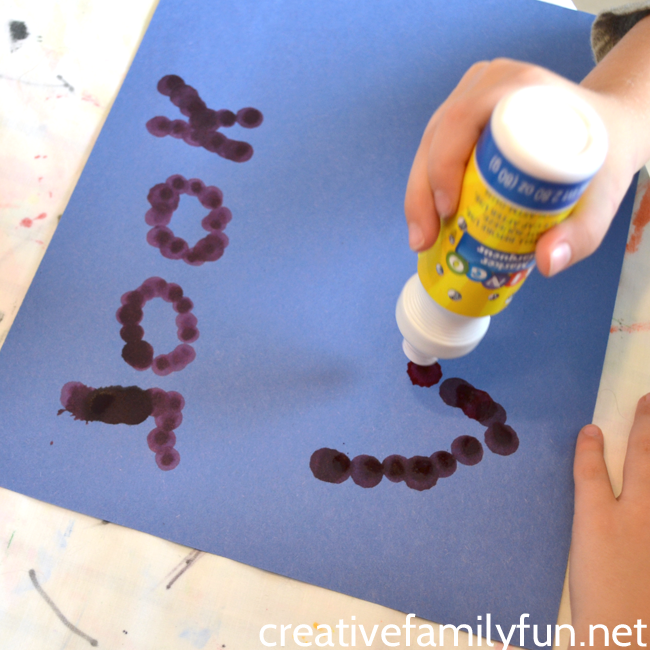 After they’ve filled the paper with their spelling words, your child can get started painting. 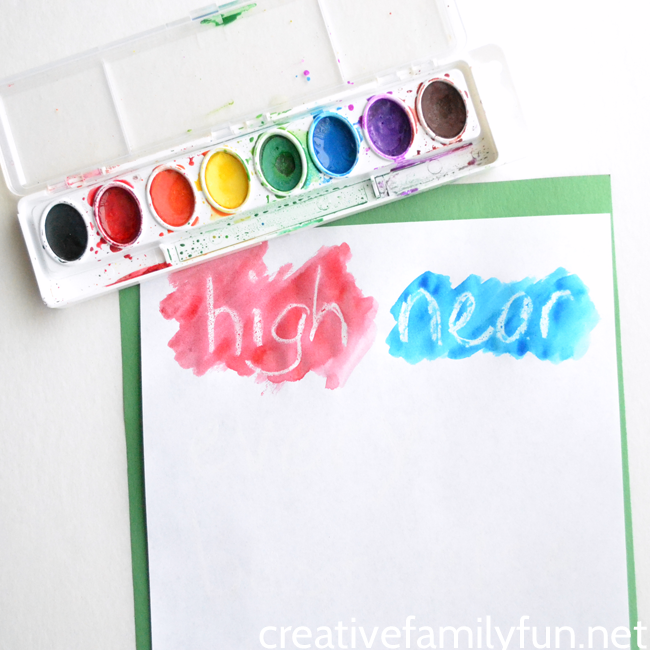 Paint your paper all one color, make patterns, or use every single color on your watercolor palette. This is time to get creative. Paint flowers, heart, or clouds over the top. Anything goes. As your child starts painting, their spelling words will magically appear. I always love art, so this activity doesn’t even feel like studying. But, in reality, your child will practice writing their words and they’ll read them a few time while painting. 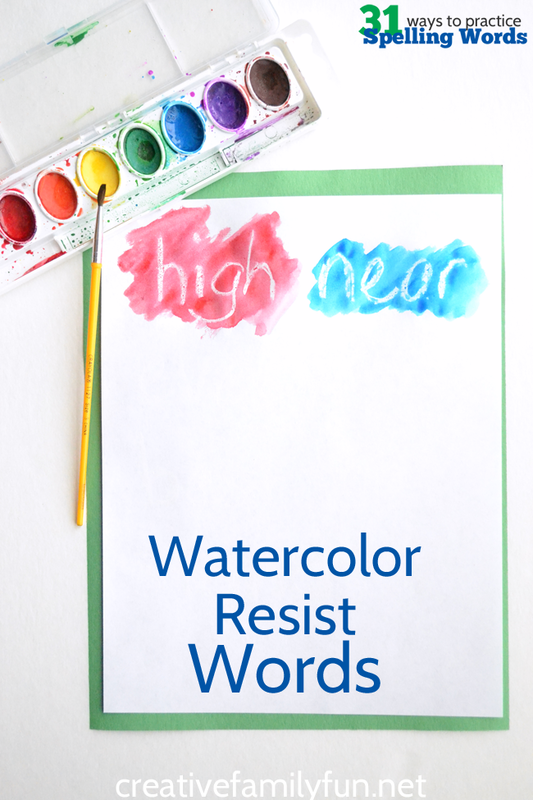 Watercolor Resist Spelling Words is fun, colorful, and perfect for any kid that loves art.